The 1989 6.9 magnitude Loma Prieta earthquake is also called the World Series Earthquake as it happened moments before the scheduled start of the third World Series game between the Oakland Athletics and the San Francisco Giants began with more than 62,000 fans in the stadium at Candlestick Park. It was the first time an earthquake had ever been broadcast live on television. Amazingly, there were only 63 deaths caused by the quake, and more than 3,700 injuries, 400 of which were severe. The majority of the deaths were caused when the Cypress Street Viaduct, a double-deck portion of the interstate, pancaked the upper deck atop the cars on the lower deck, and the Oakland Bay Bridge collapsed. The Marina district of the City, a ritzy part of town which was built entirely on landfill, shifted sharply when that landfill liquified, causing major damage to property and the loss of four lives. It was October 17, 1989, and I had just started our Christmas tree charity drive. I had spent the day calling technology companies and hotels in San Francisco, Hayward, Cupertino, and other Bay Area localities, offering our services decorating their lobbies for Christmas. I wrapped up my last phone call at 5:02 and began to walk out of the second-story office with a co-worker, Mary Beth. It was a warm northern California autumn day, and we were looking forward to the third game of the World Series, which had been dubbed "The Battle of the Bay," due to the fact that the San Francisco Giants were playing against the Oakland Athletics for the coveted baseball pennant. We could not know it then, but our King Street office would one day be AT&T Park, which would replace Candlestick Park as San Francisco's stadium. Nor could we know that within seconds, 5 people would be dead less than three blocks from where we stood, and dozens more in other parts of the state. We walked out onto the landing, and everyone in the warehouse was chattering about the baseball game and what all was in store for the evening. We were at the top of the stairs on a small landing when the jolt hit. Mary Beth, who was two steps in front of me, went tumbling down the stairs, and in my mind's eye, I can still see her glasses flying off her face and over the stairs to her right and her left shoe shooting away from her foot as she bounced down the stairs. I ran down the stairs after her and held her securely as she tried to run out of the building. While Californians are taught from childhood that being outside is the safest thing to do during an earthquake, I instantly remembered the old brick facades and jumble of electrical wires overhead and my decision months before when I first began to work there that it just didn't look safe out there. Now, anyone who has lived through an earthquake can probably tell you that it is impossible to tell how severe a quake is until the shaking and rumbling has stopped and the damage is assessed. I've always thought that this was because when the very ground beneath one's feet begins to give way, the basic insecurity and panic leaves no way to compare severity; it would be like being in an airliner as it plummeted toward the ground and trying to judge the speed of its descent. So you might understand when I relate that Mary Beth and I got into the Volkswagen Rabbit in which we carpooled to and from work and began to get ready for a lively travel conversation with friends Marianne and Sandra. The radio in the Rabbit had stopped working some months ago, and we spoke animatedly about our day. Traffic was a mess as we drove up the Embarcadero, beginning our long ride home near Golden Gate Park. We would stop for minutes at a time, making small talk to people going slowly in the opposite direction. Let me amend that: We were stalled in traffic, as was the line of cars going the opposite way on streets and roads all over the Bay Area. Sandra was in the back seat and had taken out a small notebook from her purse and was asking people, "Do you think they'll call the game?" She was keeping track of the answers of random strangers, and then she asked an older woman who looked to be in her late 60s. Her hair was disheveled, and she looked at Sandra with a look that was both impatient and insulted, and upon looking back, we realized that she was upset that something so mundane could be going on in the chaos which she had obviously already seen and which we were about to see. She began shrieking at Sandra, cursing uncontrollably and ending an unrepeatable sentence with, "...the [expletive deleted] bridge has collapsed!" I can see our reaction even now like a favorite cartoon memorized as a child: In complete synchronization and in what seems now like slow motion, we all swiveled our heads toward the bay, which was literally feet from where our car was stuck in traffic. It looked like there was a fire on the Bay Bridge, with a plume of what looked like white smoke but was actually dust from the concrete slab which fell from the upper to the lower deck. I remember not being sure whether I was horrified or awestruck, but I do remember that the idea refused to register in my brain. We got pretty quiet then, the enormity of what was going on finally sinking in for each of us. We drove mostly in silence through the maze of bars of the South of Market area, where we saw one pub still open, with a car parked on the sidewalk, its headlights providing light for the patrons who refused to leave; and an unhappy man with a towel over his shoulders, his hair a lathery purple from what was clearly a work in progress from whatever beauty parlor he had been in when the jolt hit. We drove past the usually bustling but now eerily quiet streets of the Tenderloin, where those who were deemed cured of mental illness after the state budget dwindled in the 1980s were usually around, pushing shopping carts and talking to people not there or screaming about the end of the world or the necessity of finding religion. What we encountered in that neighborhood was another image I have stuck in my mind nearly a quarter of a century later. There were winos -- homeless practicing alcoholics -- directing traffic. I almost laughed out loud when I saw the first one, eloquently waving some cars forward and directing others to wait, his hands moving as if to music. There was no noise at all in our car. The trip from King Street to 8th & Fulton, which was 5 miles away and usually took less than 20 minutes, took more than 3 hours that night, and once the enormity of what we were witnessing sunk in, we had plenty to talk about. The earthquake knocked out electrical power to the city, and it was not fully turned back on until October 20th. There was no phone service for several days, and my daughter, who was in school in Rome, Italy, was getting the reports that everyone in the whole city was dead and was worried out of her mind. Even 911 service was spotty because of a fire which had broken out in the emergency phone equipment room, and residents were reduced to using old-fashioned fire alarm boxes for a few days. We happened to have a generator, and we were the only place in the Richmond District which had lights. People poured in for coffee and conversation and to watch the only thing that seemed to be on the television news for the first three days: A video of a car falling off the top deck of the Bay Bridge and into the chasm which stopped on the lower deck. There were several dozen fires, and at least 62 people died in the quake and its aftermath. Twelve thousand were left homeless and nearly 4,000 were injured. Forty buildings collapsed in Santa Cruz alone, killing 6 people at a location near the epicenter. Sixty miles away from the epicenter, the Marina District, a lagoon had been filled in with silt and mud -- and some of the rubble from the 1906 earthquake -- in preparation for the 1915 Panama-Pacific Exposition which was meant to celebrate the resurrection of San Francisco after the 1906 Earthquake. After the exposition, the area became an enclave of quaint apartment buildings. The Loma Prieta liquified the landfill, and apartment buildings sank rudely into the lagoon. In the weeks and months that followed, people would talk to strangers about the trauma they'd experienced, just to purge the enormous trauma from their psyches. As part of the work the Red Cross was doing, I called people from a long, computer-generated list to ask them how they were and just let them talk. I frequently found myself crying while I listened to people talk about running down 40 to 52 flights of stairs as buildings swayed with each aftershock. I remember a man describing walking from the Financial District to Market Street in ankle-deep shattered glass from the skyscrapers, talking to moving company employees who were being flagged down all over town and running into condemned buildings to rescue important papers and photographs for distraught newly-displaced people, and having dinner with one of the volunteers who found a baby's body in the Marina. We survived the 7.1 Loma Prieta earthquake, but it left a scar in many of our hearts; and when I made my decision to leave my native California, it was in large part because I had become aware of just how much life can be changed in a few seconds of standing on shaky ground. Contains photographs, video, and quotes from newspapers around the world upon the event of the Loma Prieta Earthquake. Also recommends numerous related articles and narratives to read. Offers a brief description of the quake and a larger one of its aftermath. Also links to off-site resources for those who want more information about this devastating natural disaster. Loma-Prieta-Earthquake-2459219.php Displays newspaper articles from the local newspapers, published the story and photographs from the day of the quake. The photographs show the devastation, the rescue efforts, and the reactions of those who found themselves affected. Also has first-person recollections in the comments section. 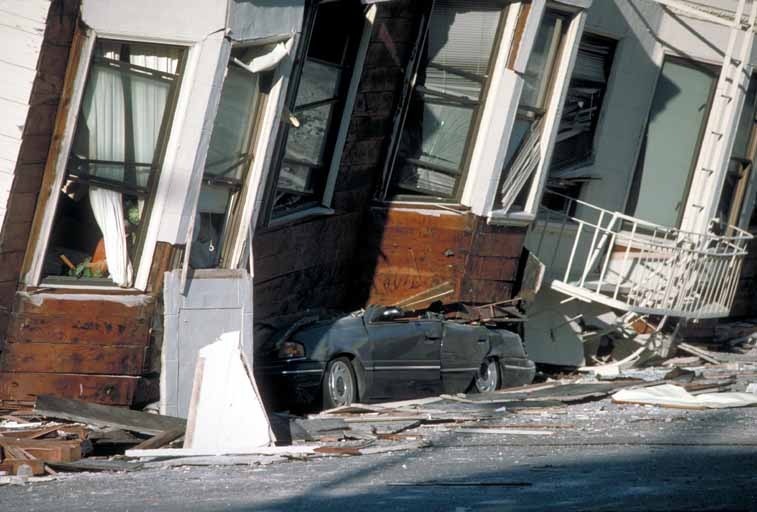 The federal government's geological department, the US Geological Service, presents its section about the Loma Prieta quake, featuring photographs of San Francisco, Oakland, the Santa Cruz Mountains, Menlo Park, and other areas affected. Additionally offers a US Department of the Interior DVD about the data they have about the earthquake. Consists of a lesson plan for teachers which effectively compares the two major earthquakes in San Francisco's history: the 1989 Loma Prieta and 1906 San Francisco earthquakes. It presents color coded maps which demonstrate the intensity of each quake, the length of the ruptures, and a comparison of the graphs. Search for Loma Prieta Earthquake of 1989 on Google, Bing, or Yahoo!